Although it may not look like it, spring is on its way, which means it’s time to start prepping for the anticipated spring planting season. This is a great time of year for horticultural therapy contracts. Everyone is itching to start planning and prepping for a successful horticultural therapy outdoor garden program, and our excitement level is right there with them. 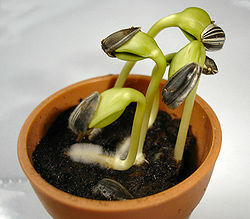 The emergence of the radicle through the seed coat of a sunflower seed. I am frequently asked, “what kinds of activities do you do in the early spring to engage participants in horticultural therapy?” I turn to garden prep activities for both engaging and therapeutic plant-based sessions this time of year. The possibilities are endless with the added perk of being very affordable and therapeutically significant. When gearing up for gardening season, I focus my horticultural therapy activities on three topics: seed plantings, propagation, and transplanting. All three topics not only have a wonderful educational component, but also serve as meaningful therapeutic activities. Seed planting, or seed germination, activities serve an educational and therapeutic purpose. For the educational component, focus on the life cycle of a seed with the group of participants. Visuals, such as a seed germination chart, help participants understand the process of seed germination. It never ceases to amaze at least one participant (especially young students) that plants, even those as great as sunflowers, start out as tiny seeds. Seedlings just starting to sprout. 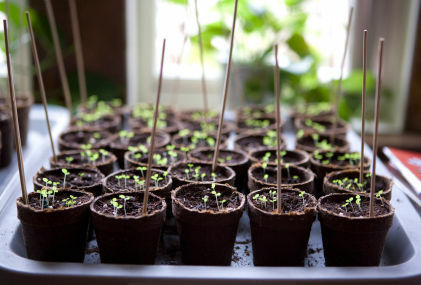 Seed germination activities allow horticultural therapists to connect the importance of seed germination and plant care to the care of oneself or others. In health care facilities or special education programs, many individuals are taken care of around-the-clock due to an inability to solely provide for themselves. Something as tiny as a seed carries great significance because it allows anyone the opportunity to care for a living thing. Participants are educated on appropriate sun exposure (typically on a light cart or windowsill) and watering techniques to guarantee the plant’s health and success. Each participant receives a variety of seedlings to tend to as we approach the planting season. The intent is to enable each individual to care for their own plant so that, when the time comes, it can be combined with other plants to create a beautiful, outdoor therapy garden. Plant propagation is another great activity for a group of any size or ability. All that is needed are containers, soil, a mother plant and some snips. Some of my favorite plants for plant propagation also add a wonderful sensory component to the activity. 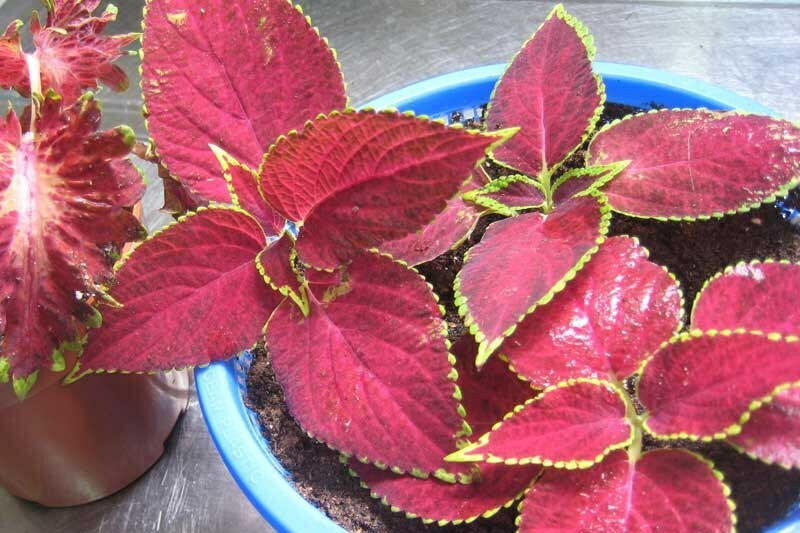 Coleus are great plants for propagation and they come in a variety of beautiful colors; succulents propagate easily and create fun talking points pertaining to desert plants; lipstick plant (Aeschynanthus radicans) adds a tropical element as well as the excitement of a potential beautiful red bloom. Coleus cuttings for plant propagation. Plant propagation activities can be used to teach valuable lessons in a health care setting. They teach a lesson about taking something old or overgrown to start something fresh and new. This activity can also be paired with a pruning activity to add to its therapeutic benefits. The concept of taking away or lessening a load in order to become more healthy is a theme that resonates with many horticultural therapy participants. When the time comes to begin planting in the garden, a lesson on transplanting can greatly enhance the garden’s immediate beauty while increasing the feeling of ownership among the participants. Ideally, the seedlings and cuttings that were previously done have developed into mature, healthy plants that are ready to transplant into garden beds/containers. Each participant has the opportunity to place their plant(s) in an area of the garden to continue to watch it flourish throughout the growing season. 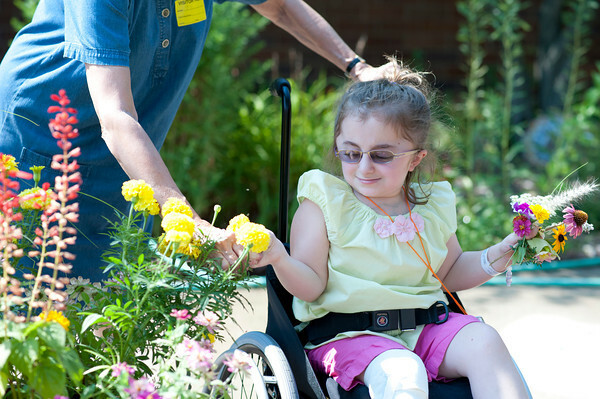 An HT participant at Shriners Hospital for Children, collecting flowers for the days activity. The feeling of ownership or pride over a space greatly enhances the success of a garden and horticultural therapy program. When participants get the opportunity to place their own plants within a shared space, their individual ownership and care over the space is heightened. They feel a sense of responsibility, not only for their plant, but for the entire garden. On numerous occasions, I have seen participants pull family members or friends out to “their” garden to show what they’ve planted. While we all continue to stay busy, start thinking of all the different activities and ways in which to engage enthusiastic gardeners with easy, horticultural therapy activities. If Punxsutawney Phil thinks spring is just around the corner then we better be ready! Until then, get those seeds going, stay warm, and dream of snow drops, crocuses, and early spring showers.